Our most versatile Media Streamer yet, the COOD-E TV 4K is available today and offers a host of exciting new features! Powered by the latest technology from AMLOGIC, the S912 Octa Core chipset gives the COOD-E TV 4K an astonishing performance. Enjoy super smooth playback of 4K Ultra HD videos at 60 frames with support for HDR 10 bit and listen to crystal clear HD Audio. 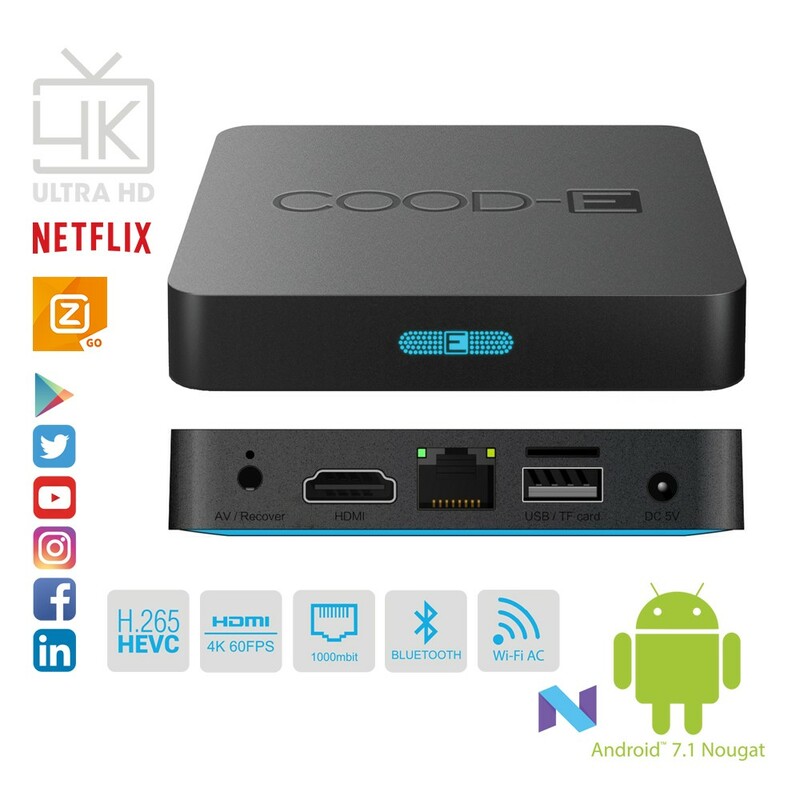 The COOD-E TV 4K runs the latest version of Android 7 Nougat, which provides you with all your favorite applications from the app store right on TV. With its WIDEVINE Level 1 DRM security the COOD-E TV provides you YouTube 4K and Netflix 1080P. The COOD-E TV is developed in Europe and during production only premium materials and components are used. The hard and software are optimized for each other and the COOD-E TV 4K has a brand new user interface that lets you control the device in an easy and convenient way. Via the build in Gigabit LAN, AC Wireless and Bluetooth 4.0 you can stream all your favorite content from your local network, the internet and even from your tablet or phone right to your TV. The USB port and TF card slot makes it possible to connect an external HDD or plug in your micro SD card. The COOD-E TV 4K is compact in size, so easy to install anywhere and it’s even mobile enough to take it with you.